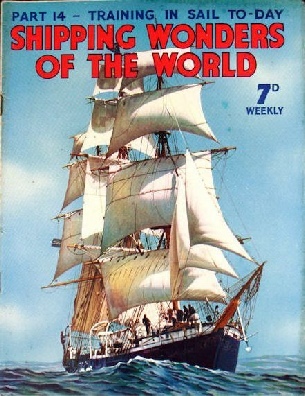 Part 14 of Shipping Wonders of the World was published on Tuesday 12th May 1936. It included a centre photogravure supplement featuring native craft, which formed part of the article on A Gallery of Native Craft. This illustration was later used as the colour plate issued with part 45. The Monarch of Bermuda and the Queen of Bermuda were both built by Vickers-Armstrong, the latter at Barrow-in-Furness (Lancashire), and the former at Walker-on-Tyne (Newcastle). The electric motors are by the General Electric Company, Witton, Birmingham, and the boilers are by Babcock & Wilcox. These vessels are among the largest electric ships in the world, having four screws and a speed of 20 knots. This is the ninth article in the series on Merchant Ship Types. EXERCISING THE DOGS. 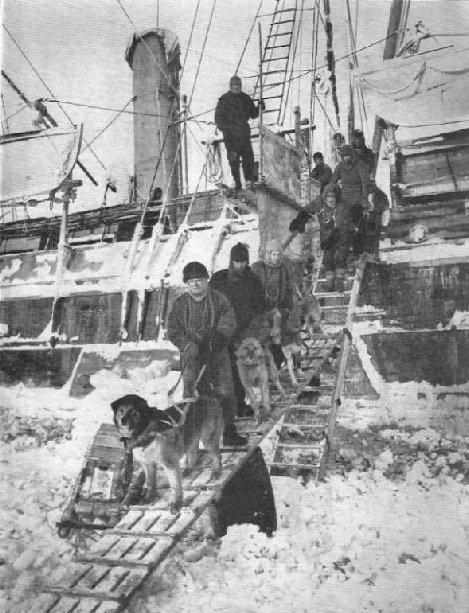 The photograph shows George Marston leading the dogs down on to the ice floe from the Endurance. Shackleton is standing on the platform overlooking the gangway. Six teams had been formed, each having nine dogs, and considerable time and pains had been spent on their training. Each team had its leader dog whose duty was to maintain discipline in the team by punishing disobedience or shirking. Crean, Hurley, Macklin, Marston, McIlroy and Wild were in charge of the respective teams, and each man was responsible for exercising, training and feeding his own dogs. Remarkable yet primitive vessels are still built in remote places of the world, often without adequate material, but always with a skill that has been inherited through many generations. In this chapter, Sidney Howard describes the primitive boats of Egypt, China and the Pacific Islands. Many features now incorporated in modern ships owe their origin to small craft of this type. The article includes a four-page photogravure supplement, shown below. The article includes a four-page photogravure supplement as follows. 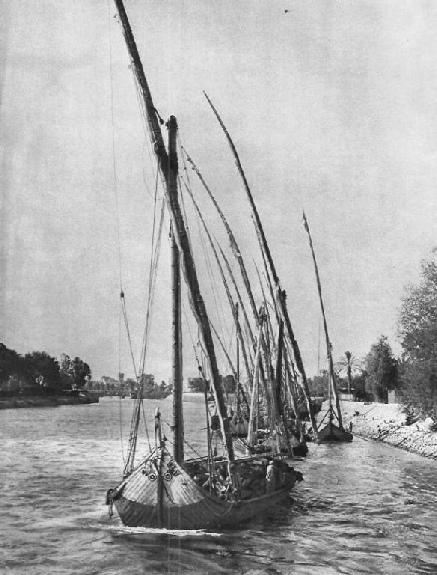 A FLEET OF NILE BOATS at Sahil Atar el Nahi, Old Cairo, a quay on the Nile. The curious high stems of these boats resemble the boats of the ancient Egyptians, but the lateen sails are derived from the Arabs. The exceptionally long yard of the lateen rig enables the Nile boat to catch the wind when sailing close to the high banks of the river. ON A CHINESE RIVER. A large amount of traffic is carried in China by water. 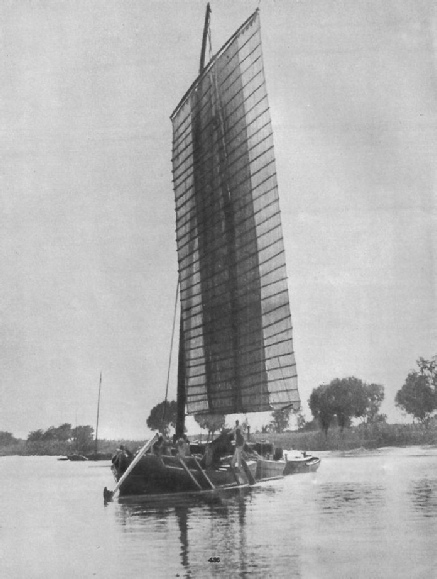 The junk illustrated is typical of the craft on the Pei Ho River. The sea-going junk, which uses similar sails, is one of the most seaworthy sailing vessels in the world. 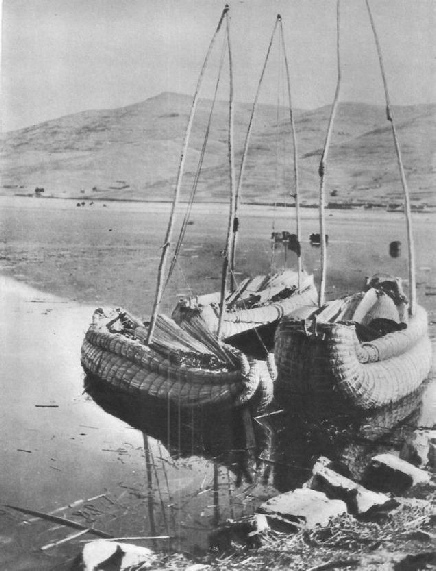 BALSA BOATS ON LAKE TITICACA, in South America. These small boats are made of logs from the balsa tree, connected by wickerwork. The buoyancy of balsa wood is about twice that of cork, and the wood is said to be the lightest in existence. The shape of the balsas has not changed since the days of the Incas. An account of the remarkable oscillating paddle engines of the last century and of the introduction of the surface condenser, an important development in marine engineering. This chapter is by F E Dean and is the third article in the series Marine Engines and Their Story. 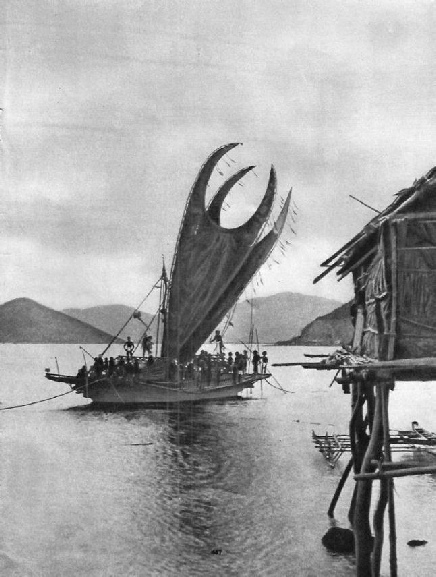 CRAB-CLAW MATTING SAILS on lakatoids at Huanabada, Central Papua. Lakatoids are built of two canoes, fastened together by struts, the space between being decked over. To make the “crab-claw” sail, strips of matting are plaited together, and the sail-cloths are then sewn. Three stakes form the framework on which the sail is made. The upper stake, forming the bend of the “claw”, is bent into the curve. To set the sail, it is first hoisted horizontally, and the foot is brought down and made fast to the foot of the mast. The Belships have been specially designed and constructed for taking on board any cargo that is too heavy or too bulky for the ordinary cargo ship to manage. Some of the most remarkable cargoes ever carried in hips are handled by the firm of Belships Limited. The carrying of heavy and awkward cargoes, such as locomotives, lightships, pipelines or barges, is the special work of this company, which processes a fleet of striking ships designed for the purpose. A C Hardy contributes a fascinating chapter on this subject, which is the first in the series on Romance of the Trade Routes. Those who desire it can still be trained for the sea in sailing ships, and there are a number of special ships in which voyages of instruction can be made. For certain appointments, both British and foreign, such experience in a sailing ship is compulsory. This chapter is by Frank Bowen and deals with the sailing ships now afloat that afford such training, and describes the methods employed. The value of training in sail is the subject of much discussion at the present time. Whatever views may be held on the subject these details of vessels of sailing under different flags are of absorbing interest. When the Suevic was wrecked off the Cornish coast her bow was so badly damaged that it was at first believed that the ship would have to be abandoned to the sea. Enterprising salvage engineers however carried out a daring piece of ship surgery, which Frank Bowen describes in this chapter. After being fitted with a new bow, she has since survived for many years as passenger liner, troopship and whaling mother-ship in the Antarctic. The article is concluded in part 15.